What you'll need: Scissors, embroidery floss and your earphones. I used 4 embroidery floss in shades of pink and coral to match my custom designed iPhone case. 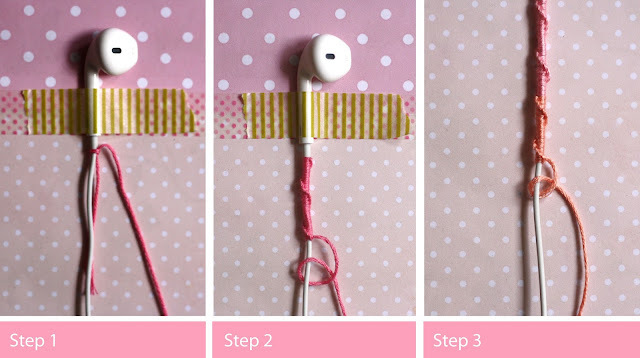 STEP 1: Tie the embroidery floss onto the end of the earphone wire. Make sure the knot is secure. STEP 2: Start wrapping the wire using the "Chinese Staircase" pattern. This pattern is similar to the most common friendship bracelet that we used to make back in high school. STEP 3: If you feel like adding another color just tie the string over the first one. Using the new string, continue the wrapping. How long? It doesn't matter! It is all up to you! Just keep on doing it until you cover the entire earphone wire. Et voila! You're done! Easy, right? Yipee! I always love everything personalized and matchy matchy. 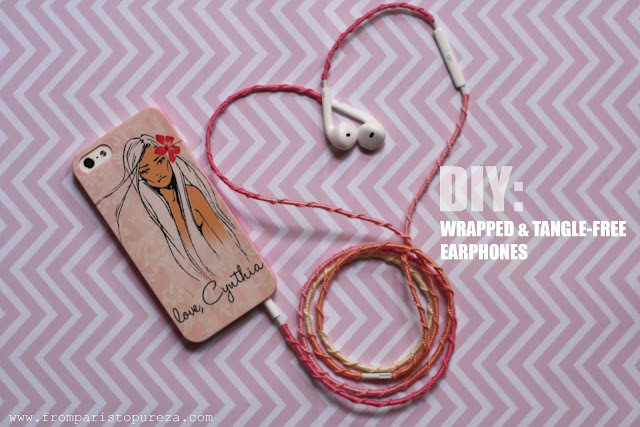 So how do you like my DIY wrapped and tangle-free earphones? Love love love, lovelies! Happy weekend!